Tibet is known as the "Roof of the World", the very name evokes feelings of awe and mystery, and a land of ancient Buddhist Culture., tremendous landscape, artistic monasteries, exotic cities, hidden valleys and centuries-old caravan trails. 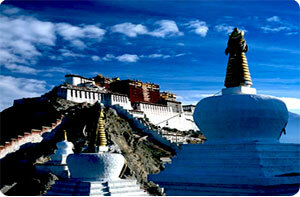 Tour in Tibet is one of the popular adventure destinations. Tibet tour offers an adventure, a special experience of a unique culture where religion and Buddhist faith are inseparable from everyday life. Tour in Tibet is one of the world's most extraordinary destination and there is adventure indeed lurking around almost each and every corner of Tibet. Since Tibet tour has been open Himalaya Journey Treks and Expedition has depth experience to operate all kind of Tibet tour in Tibet and HJT professional tour guide will take you to interesting and exciting places of natural wonders, enabling you to experience high adventures and local cultures set against the magnificent backdrop of the Himalayan range - a setting where joy and tranquility prevail for one's eternal peace and happiness.Tibet adventure tour is journeys of scenic and religious discovery, overwhelming culture, impressive ceremonies and monasteries all located in the breathtaking landscape of the Himalayas as well Tibet tours is one of the most adventurous, scenically stunning and physically demanding trips in the world, through harsh conditions with the gaspingly thin air, past sacred mountains glinting with ice, numerous crystal holy lakes, and remote high altitude deserts to the Rooftop of the World! Himalaya journey Trekking ‘s professional arrange all type Tibet adventure tours including Lhasa tours, Tibet overland tour, Kailash Mansarovar tour, Simikot kailash tour , Tibet Everest base camp tour, Namatso lake tour, Kham valley tour, Tibet monumental tour, Tibet cultural tour, Tibet package tour, Tibet Helicopter tour , Saga Dawa Festival tour, Everest base camp tour with local and experience staff. Our huge number of clients is forever expanding as these adventurers return home with exciting tales of exploration in and around the Tibet..We take delight in our high quality personal service, professional and friendly approach and providing well-organized, enjoyable and successful tours that go beyond the standard travel itinerary. HJT main goal is to give all those who travel with us a deeper insight into the land and its people. For exploring your dreams, and adventure package tour , trekking and Expedition in Tibet Himalaya Journey Trekking and Expedition ,Nepal heartily welcomes all of you to join us in a memorable and wonderful adventure that comes once in a lifetime.